NC Plant Conservation & Beyond: Cabbage Time in Carolina! 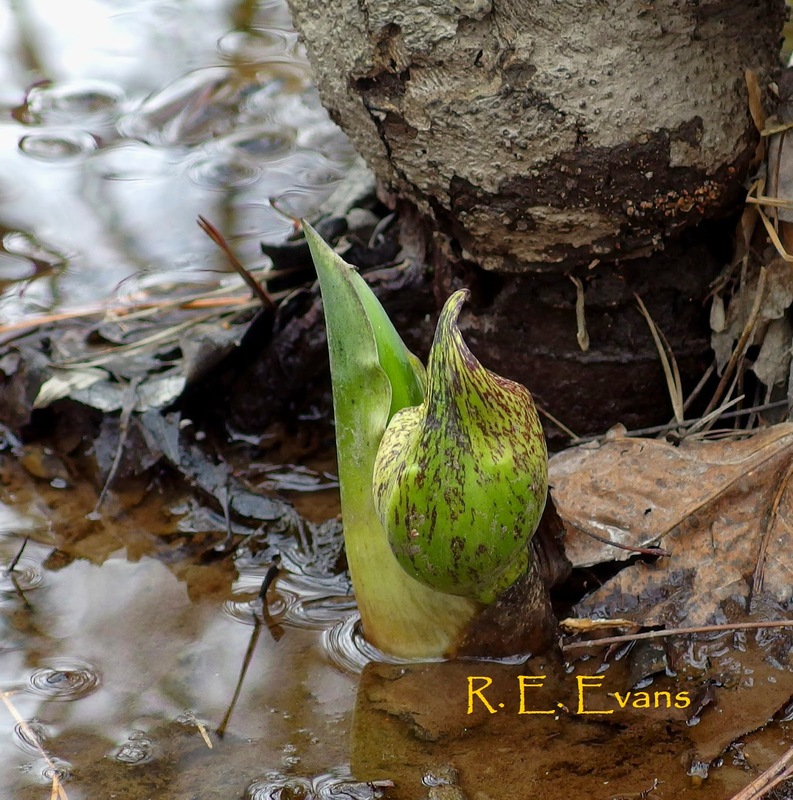 Skunk Cabbage (Symplocarpus foetidus) is one of our earliest, native bloomers. In mid-February, I observed dozens, possibly hundreds, of individuals pushing up through leaf litter, muck, and shallow water at a site near Warrenton, NC. The stout emerging stalks are amazingly thick and leathery to the touch. They unfurl at various rates to form leafy "spathes". I observed incredible variation in the appearance and coloration of these, ranging from light green to heavily striped, to mottled, to almost solid dark red. Skunk Cabbage is a member of the Araceae family, which includes mostly tropical species. 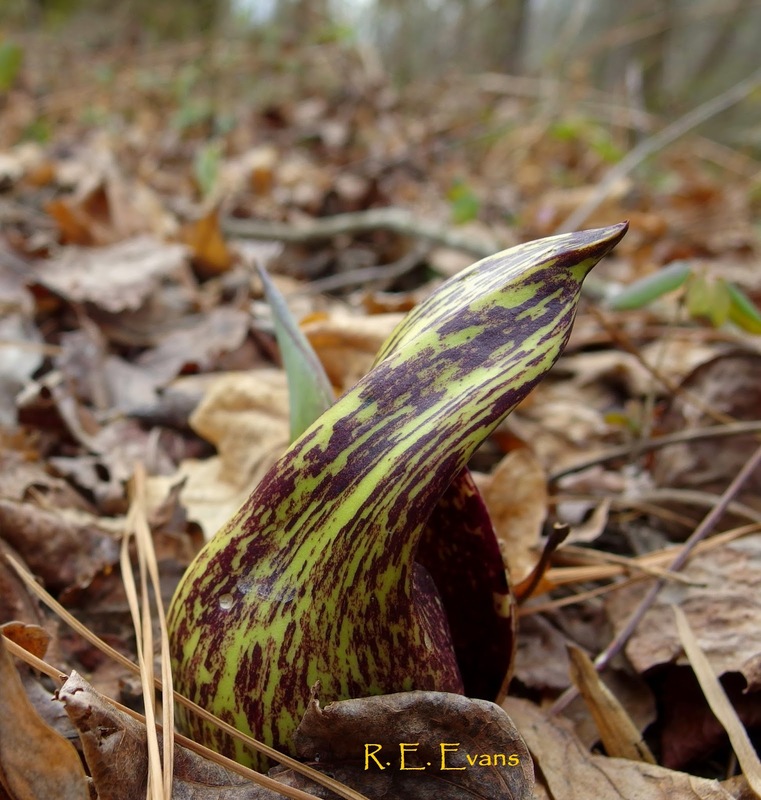 In our area its closest relatives include Golden Club & Jack-in-the-Pulpit. 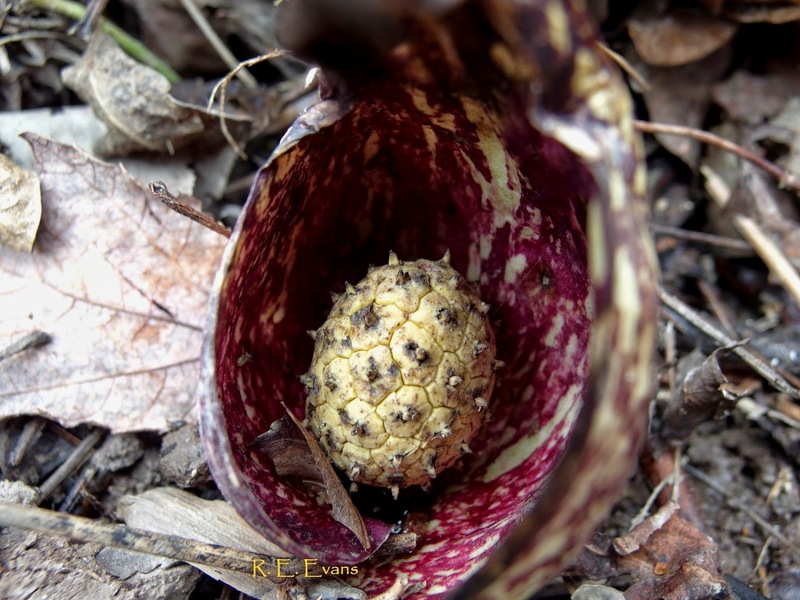 Symplocarpus foetidus is the only species of the genus in North America; Western Skunk Cabbage belongs to a different genus. Symplocarpus also includes some disjunct members in eastern Asia. It has been suggested the Asian and North American species of Symplocarpus have been isolated from one another for over 6,000,000 years (1). Skunk Cabbage is famous for the ability to produce heat during early season flowering, a process sometimes called "thermogenesis". Indeed, S. foetidus is one of the most precise thermoregulators known, and is apparently able to maintain temperatures within ~ 3.5 ° C range, while ambient temperatures range over 37.5 ° C (2). Exactly what value thermogenesis conveys to the plant, if any, is unclear. Some believe it is an evolutionary hold-over present in a few primitive plant families. According to Seymour & Blaylock (3), "there is no doubt that warming advances development and permits early flowering, but the adaptive value of this is obscure". I observed several plants with groups of what appeared to be fruit flies buzzing around. Some authors have suggested the plant's thermogenic qualities provide a more attractive site for early season insects like these. Grimaldi & Jaenike (4) found that Skunk Cabbage is "a major breeding site" for one species of fly that "looks enough like Drosophila so that the casual observer might be confused" (5); I certainly wouldn't have known the difference! 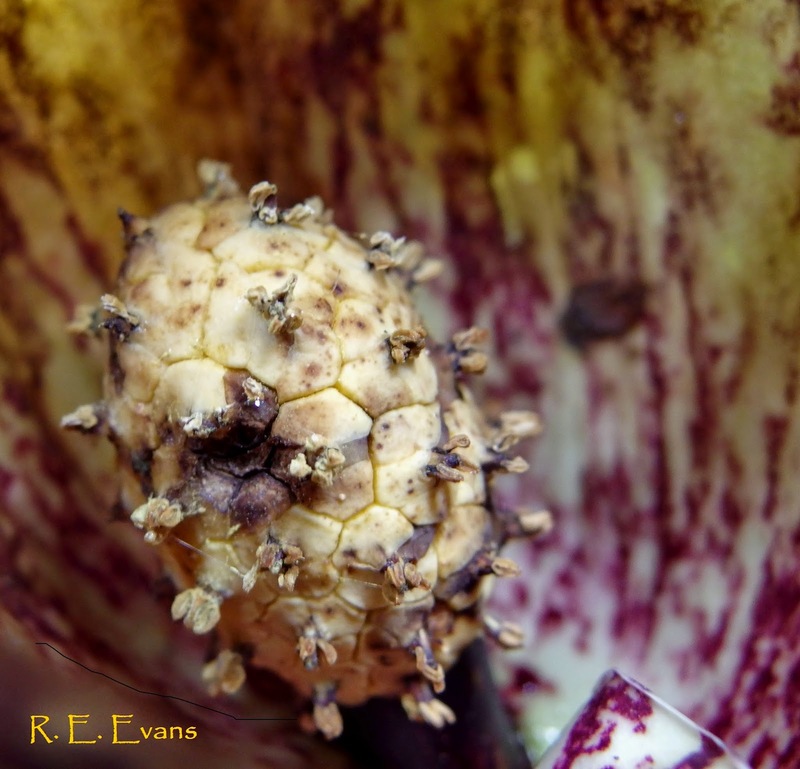 Whether these insects pollinate the flowers on the spadix is unclear. The condition and maturity of the spadix and presence or absence of flowers was quite variable during my visit. The following series of images shows a bit of this, as does the image above (with the dark brown spadix). However, very few spathes were open enough to easily reveal the contents. Even fewer were flowering, like the examples shown to the left. Several appeared to be just past and others much more so, while at least one spadix (below) seemed to still bedeveloping. 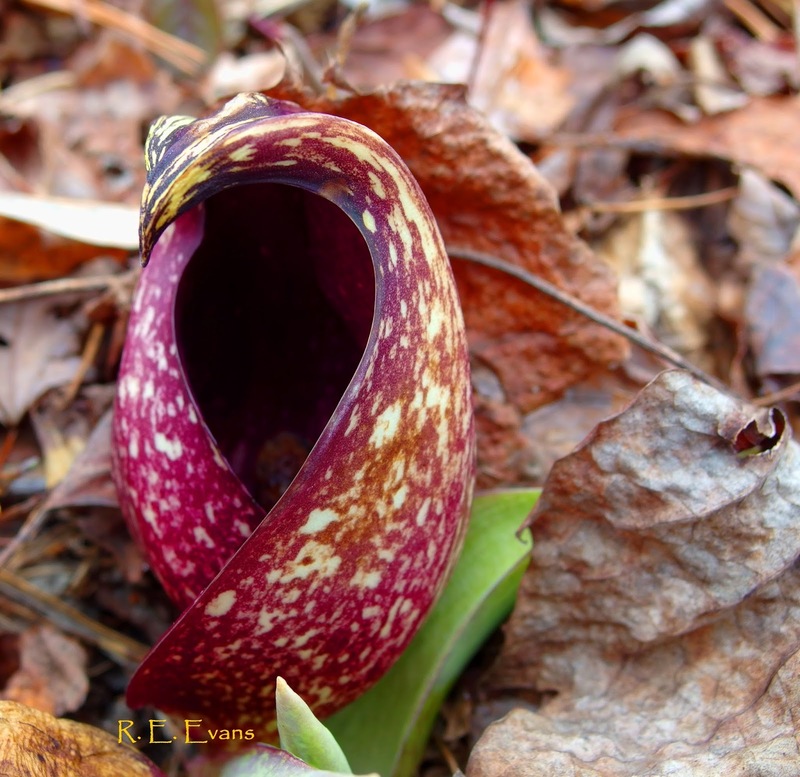 North Carolina has the southernmost ranging populations of Skunk Cabbage is eastern North America. The species creeps into a few northern mountain counties in eastern Tennessee and western NC. Further east, there are 3 or 4 reported counties in the NC piedmont. The site for these images is in Warren County, close to the Fall Line. Although often considered a piedmont county, it sure felt like I was in the coastal plain. The habitat was a non-alluvial wetland ranging from moist to mucky soils. Tulip Poplar & Red Maple were probably the dominant trees, but Black Gum and an occasional Pond Pine were present, Cane & White Bay Magnolia were common as well. Most of the plants were found in and around the muckiest and wettest area near the streamhead. most plants occurred above the standing water where a faintly developed "Y"
(1) Jun Wen, R.K. Jansen, and K. Kilgore. 1996. Evolution of the Eastern Asian and Eastern North American disjunct genus Symplocarpus (Araceae): Insights from chloroplast DNA restriction site data. Biochemical Systematics & Ecology 24: 735-747. (2) Seymour, R. S. 2004. 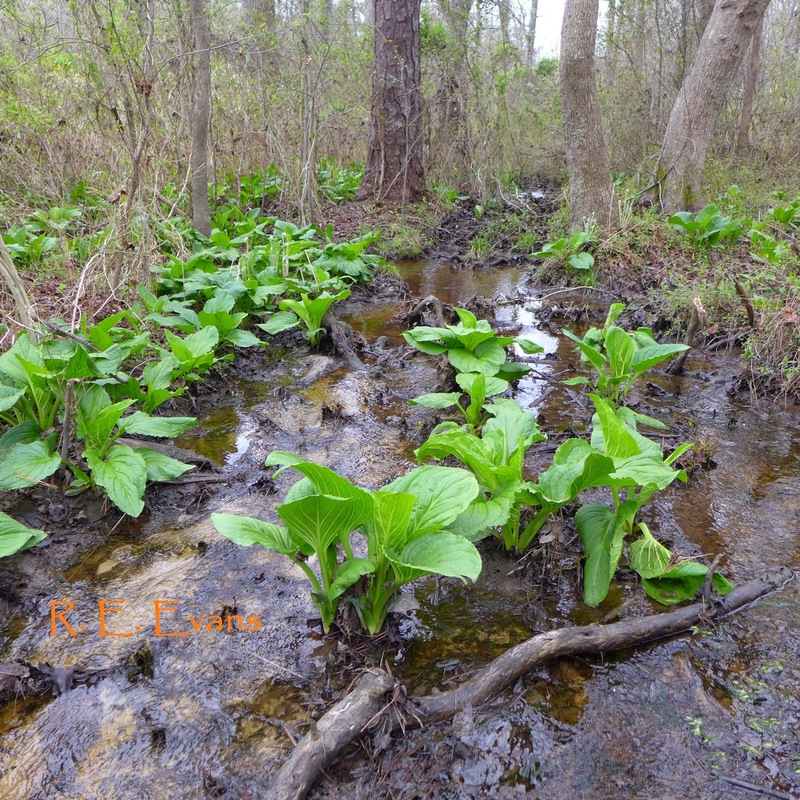 Dynamics and precision of thermoregulatory responses of eastern Skunk Cabbage. Plant, Cell,& Environment. 27: 1014-1022. (3) R. S. Seymour & A.J. Blaylock. 1999. 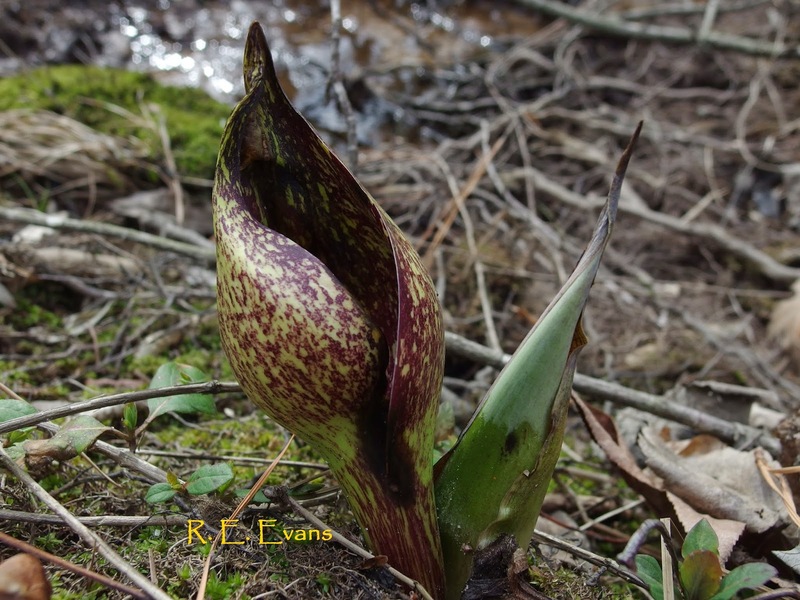 Switching off the heater: influence of ambient temperature on thermoregulation by eastern skunk cabbage (Symplocarpus foetidus). Journal of Experimental Botany 50: 1525-1532. (4) D. Grimaldi & J. Jaenike. 1983. 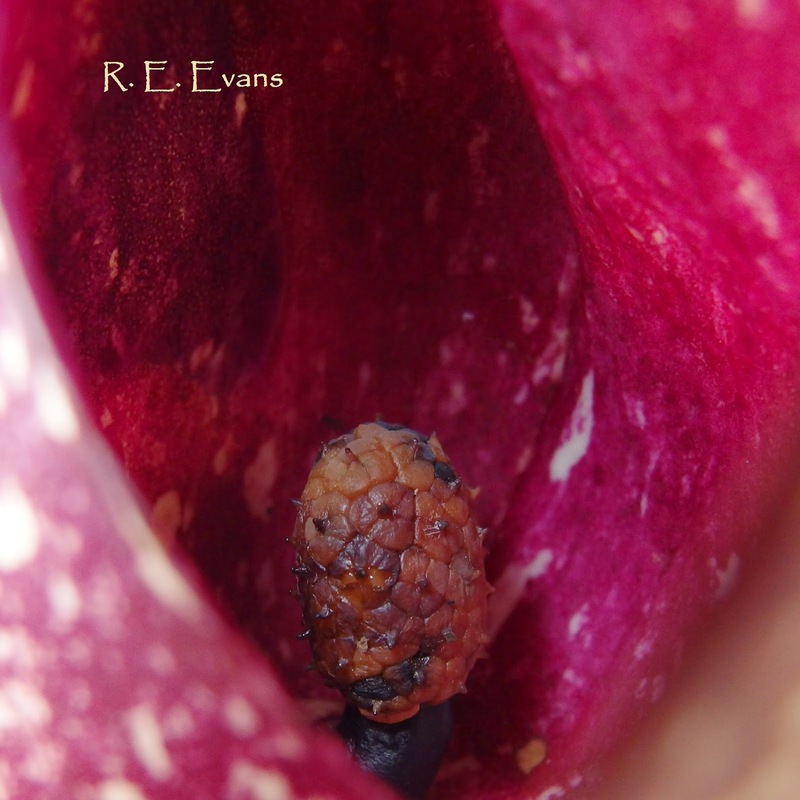 The Diptera Breeding on Skunk Cabbage, Symplocarpus foetidus (Araceae). Journal of the New York Entomological Society 91: 83-89. (5) H. D. Stalker, 1945; On the Biology and Genetics of Scaptomyza graminum Fallen (Diptera: Drosophilidae).